The Big Island is home to large herds of cattle, brought to Hawaii over 160 years ago. The Parker Ranch is the center of this historic legacy, providing beef to local eateries. 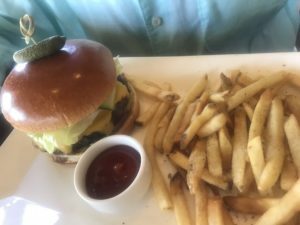 Across the Big Island, scrumptious burgers are made from this locally sourced, grass-fed, organic beef. With that as a foundation, the quest to sample and rate the very best was a fun task to undertake. All the burgers we ate came with lettuce, tomato, and mayo. At Annie’s and Village Burger, there were many other topping choices. Here are our top three picks. The restaurant has indoor and porch seating and music in the evenings. A nice happy hour every day from 4-6 has discounted Mai Tais and appetizers. 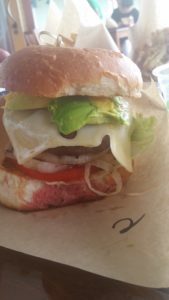 We’d heard about Annie’s but had never taken the drive, 7 miles south of Kailua-Kona on the Mamalahoa Highway, to dine check it out. We sat at a table on the open-air lanai enjoying gentle, fragrant breezes. 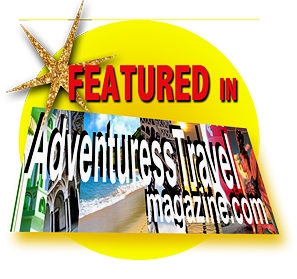 Annie’s boasts grass-fed Island-raised beef and wholesome local produce from Annie’s own on-site garden. For another $1.95, I added the delicious hand-cut fries topped with basil and lots of roasted garlic. Bub choose the Ultimate Classic Burger: A thick, hand-formed, locally raised beef patty topped with melted sharp cheddar cheese. Served with local vine-ripe tomatoes, organic lettuce, house-made pickles & red onions on a toasted classic bun $13.95. 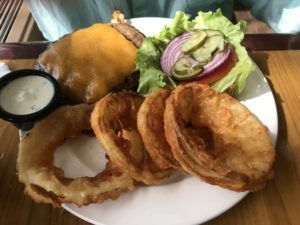 His side choice ( also $1.95) was the Sweet Tempura Onion Rings were made with Sweet Maui Onions coated in tempura batter and fried to perfection. Onion rings that had you eat past being full! 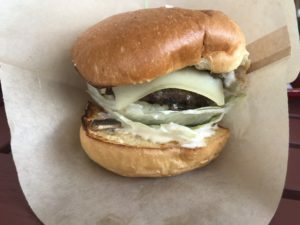 Located in Waimea (also known as Kamuela), The Village Burger’s selections focus on locally sourced, pasture-raised beef and veal along with a Kahau Ranch Wagyu Burger. 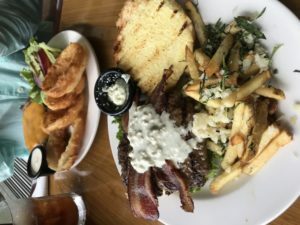 We both choose the Big Island Burger which combines brisket and chuck ground daily for a tasty “robust, arrogant” burger. Sturdy enough to hold the fixens, yet soft and fluffy, the grilled brioche buns made exclusively for Village Burger are the best buns I have ever eaten. Grab plenty of napkins: these burgers are delightfully messy, especially with toppings. I added sauteed mushrooms, grilled onions, and Swiss cheese topped the large patty. Take-out-although, there are 3 tables outside on the sidewalk if you can score one and more seating inside in the Parker Ranch Food Court. You can’t really go wrong with any of these choices. Depending on where you are on any given day, pop into one of them and feast!